(Nanowerk News) Believe it or not: X-ray works a lot better on rocks than on paper. This has been a problem for conservators trying to save historical books and letters from the ravages of time and fungi. They frankly did not know what they were up against once the telltale signs of vandals such as Dothidales or Pleosporales started to spot the surface of their priceless documents. Now Diwaker Jha, an imaging specialist from Department of Chemistry, University of Copenhagen, has managed to adapt methods developed to investigate interiors of rocks to work on paper too, thus getting a first look at how fungus goes about infesting paper. The findings are published in the Journal of Analytical Atomic Spectrometry ("Morphology and characterization of Dematiaceous fungi on a cellulose paper substrate using synchrotron X-ray microtomography, scanning electron microscopy and confocal laser scanning microscopy in the context of cultural heritage"). This is good news for paper conservators and others who wish to study soft materials with X-ray tomography. "Rocks are easy because they are hard. The X-ray images show a very good contrast between the solid and the pores or channels, which are filled with low density materials such as air or fluids. In this case, however, paper and fungi, both are soft and carbon based, which makes them difficult to distinguish", says Diwaker. Diwaker Jha is a PhD student in the NanoGeoScience group, which is a part of the Nano-Science Center at Department of Chemistry. He investigates methods to improve imaging techniques used by chemists and physicists to investigate how fluids move in natural porous materials. At a recent conference, he was presenting an analysis method he developed for X-ray tomography data, for which he was awarded the Presidential Scholar Award by the Microscopy Society of America. And this sparked interest with a conservator in the audience. Hanna Szczepanowska works as a research conservator with the Smithsonian Institution in the USA. She had been wondering how fungi interact with the paper. Does it sit on the surface, or does it burrow deeper? If they are surface dwellers, it should be easy to just brush them off, but no such luck, says Jha. "As it turns out, microscopic fungi that infest paper grow very much the same way as mushrooms on a forest floor. However, unlike mushrooms, where the fruiting body emerges out of the soil to the surface, here the fruiting bodies can be embedded within the paper fibres, making it difficult to isolate them. This is not great news for conservators because the prevalent surface cleaning approaches are not adequate", explains Diwaker Jha. In working out a way to see into the paper, Jha investigated a 17th century letter on a handmade sheet and a 1920 engraving on machine-made paper. Compared with mushrooms, these fungi are thousands of times smaller, which required an advanced X-ray imaging technique available at the European Synchrotron Radiation Facility (ESRF), Grenoble, France. The technique is very similar to medical tomography (CT scanning) done at hospitals but in Grenoble the X-ray is produced by electrons accelerated to about the speed of light in an 844 meter long circular tube. A handy comparison: "If I were to use medical X-ray tomography to look at an Olympic village, I would be able to make out only the stadium. 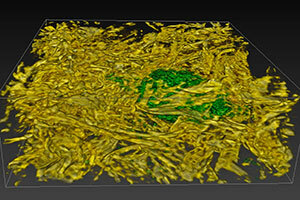 With the synchrotron based X-ray tomography, I would be able to distinguish individual blades of grass on the field.". Diwaker hopes that conservators will be able to use the new insight to develop conservation strategies not just for paper artefacts but for combating biodegradation on a host of other types of cultural heritage materials. And that the developed methods can be extended to other studies related to soft matter.